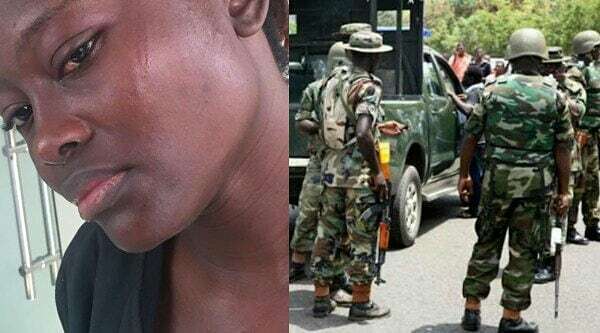 A Nigerian lady battered by soldiers who almost knocked her down in Marina area of Lagos, took to Instagram to lament over her ordeal in the hands of the security operatives. According to the lady battered by the soldiers @missadenuga, she was beaten for questioning the men who were over-speeding. She added that she went to nearby Bonny Camp to report the soldiers, but was not allowed in as the lady at the gate claimed she can’t report a soldier to a soldier. “So I was beaten blue black by men in uniform this morning by marina b/stop …. I was crossing.. out of the blue a car almost ran me down…. on a one way,I challenge the car for the speed on a one way.. when the car parked there was three soldier men and a woman… before I know what was happening I was descended on for questioning them for almost running me down with their car… wasn’t able to get their faces but I got their plate number..